Ridley Scott has directed two of the greatest, most geek-inspiring sci-fi films in the history of cinema, namely, Alien (1979), and Blade Runner (1982). Where Alien created new benchmarks for genre films in terms of character development (especially with the iconic Ellen Ripley, played by Sigourney Weaver), and also visual design with its evocative set and creature designs by H.R. Giger, Blade Runner has been hailed for its profound and complex subtext. So going in to see his latest (and long-awaited) foray into the genre, expectations are perhaps a tad high, and obviously not just with regards to special effects and action sequences. 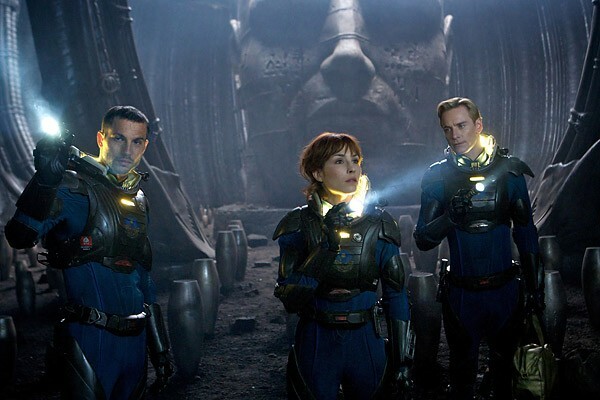 Somewhat like Avatar before it, one can imagine that a lot of cinegoers would have looked upon Prometheus as a cinematic Second Coming, particularly since it is posited as a prequel of sorts to Alien. That it was bound to be a let-down of some fashion for most was almost a given, then, and it is, just not an egregious one. The beef that many will presumably have with the film is that it asks more questions than it answers (a task to be fulfilled in the sequels that will doubtless follow), not to mention the rather lead-handed political (‘they created us, now they’re trying to destroy us’) and quasi-theological (‘WE are the gods now’) subtext at work. It starts off audaciously (and mystically) enough, with a human-like creature standing at the edge of a precipice somewhere on what may (or may not) be Earth, ingesting a mysterious substance, and then disintegrating and dissipating as he plunges into the water below. Cut to a millennia or few later and scientists Elizabeth Shaw (Rapace) and Charlie Holloway (Marshall-Green)awake aboard the space vessel Prometheus, an expedition funded by the Weyland Corporation to find the source of an ‘invitation’ found on Earth in the form of ancient cave paintings – a source which may (or may not) reveal humanity’s true origins. Under the glacial, suspicious gaze of supervisor Vickers (Theron), and with the dubious ‘assistance’ of android David (Fassbender), the two specialists and their rag-tag team reach their intended destination. And, quite needless to say if you’ve ever seen any horror/monster movie in your life, here is where the excrement hits the fan: heroes fall, dubious, hidden agendas are unmasked, and human and alien innards splatter in glorious 3D. But is it all sound and fury and intestinal gore signifying nothing? Not exactly, but the problem may be that the film is trying to signify a little too much, with way too much substance, nay, material being explored and pontificated upon in the narrative. Comparisons with Alien are of course inevitable and here is where Prometheus suffers rather a lot. Alien focused on the business of being a groundbreaking sci-fi horror; Prometheus also wants to be a treatise on the origins of spiritual man. The earlier film’s spare but creeping, quiet horror build-up has been replaced with bombast and verbosity which, ironically enough, serve to distance the characters and their predicament from the audience. Where Alien’s Ripley, through the course of the film, became a dynamic character that was still one could relate to and root for, Elizabeth Shaw (no discredit to Rapace) is never a compelling enough character to be invested in. The same is true of the rest of the crew, particularly the just plain odd casting of Pearce as old man Weyland, buried under layers of bad facial prosthetics. Having said all that, Prometheus is still a rewarding experience at the movies, if only for its sumptuous visuals and consistent, expertly executed pacing (not to mention, the ace closing money shot)which make it entertaining and engaging enough. And who knows, like Blade Runner before it, maybe its true worth as a piece of cinema will be realized twenty years from now. In the meantime, what it does do rather well is make you want to revisit the original masterwork. Cult: Solaris (1972) – Andrei Tarkovsky’s haunting, dream-like exploration of space (and love) has boggled and awed many a mind in the forty years since its release. Current: Men In Black III – More aliens, but for giggles, with this fun sequel to the earlier two Men In Blacks laugh fests. Coming Attraction: Untitled Blade Runner Project (2014) – Is it a sequel? A prequel? A reboot? Scott isn’t telling, but it has set the net buzzing already. I did actually go see the original alien afterwards! What I immediately noticed, as you mentioned, was how the modern cinema tries to constantly keep the viewer engaged with on-screen action. Perhaps in order to keep up with shrinking attention spans. It does serve to lower the film to ‘avengers’ model and just cheapens the experience a bit imo. I think the film would become more interesting if watched from David’s perspective, who develops an emotional context when he sees the humans ‘meeting their maker’, while he is already there among his.